Within days of the birth of his first daughter, Janet and Lavagn Claudio received the news that his girl Ajalee had been diagnosed with arthrogryposis multiplex congenita, a syndrome characterized by several bent joints that existed at birth. The exact cause of arthrogryposis multiplex congenita is still unknown, although it is known that some types are inherited, this is not the case Ajalee. At eleven years old, Ajalee and has undergone four operations and uses a wheelchair. Very sweet and somewhat shy, Ajalee is a girl with big dreams. "He wants to be a chef and have its own restaurant," said his father. "Also wants to be a singer Christian rap," said his mother. Ajalee is school student Chestnut Accelerated Middle School, which is known for its academic excellence in reading and writing, is a member of "Clay," the troupe of his church, and songwriter which sometimes has sung publicly with his father. The Brianna Fund Ajalee organization chose as his "Brianna Fund Angel" by 2014. This organization is dedicated to helping families who have children with special needs and who are in need of some help for mobility. "Your mission is to go to the community to help families because there was a time when they were in need and I help the community," said Claudio Lavagn. ​Brianna Fund was founded in 1998 and has helped over 40 families of Springfield. 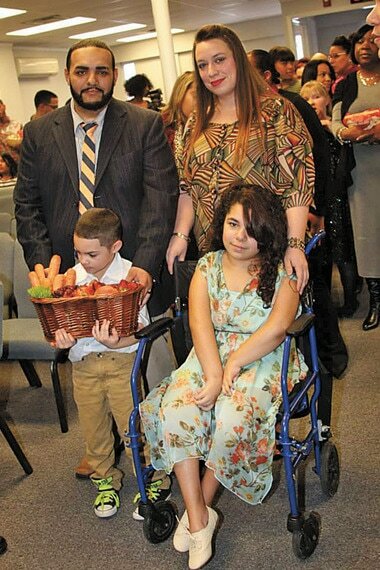 The foundation will be giving him the Claudio family, a vehicle ramp for wheelchair Ajalee. This ramp will allow the family to convey Claudio motorized wheelchair, 400 pounds, everywhere. This will give you the freedom to Ajalee to participate in events such as wheelchair basketball, foot ball wheelchair and wheelchair dancing. "We want to give our sincere thanks to Brianna Fund for its great unconditional support to our family," concluded Janet Claudio.